Recently, we asked 1973 COE master’s graduate Larry Feldman about his career, his views of education, and the challenges faced by Miami-Dade County Public Schools and other large school districts. The conversation has been edited for length and clarity. 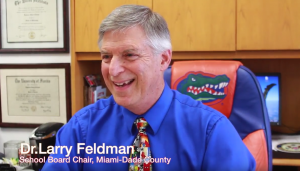 In his office, Larry Feldman shows his support for his alma mater in this screen shot from an interview with Miami Today. Q: What do you remember most from your experience at the UF College of Education that has shaped your career as a professional educator? A: My professor and mentor Art Combs focused on the human potential of each student, taking into account the whole child. You have to understand what validates their needs and through that you can teach anything. Today, that still applies, even if kids are fixated on their handheld mobile devices, for example. You can never get away from that potential for human development if you want to pass on empathy, courage and passion. That’s what students want: to be cared about, for someone to see them, touch them and hear them. As a teacher you can almost redirect every student individually with everything you are feeling and perceiving. To understand how far a person can go, you need to understand their mental, physical and spiritual qualities. We must pay attention to all of those qualities if we are going to produce strong civic leaders and productive members of a community. Q: What are the biggest challenges faced by a large urban district like Miami-Dade? You’ve mentioned a lack of funding and concerns about proposed legislation (SB 376) requiring Florida school districts to share local tax dollars with charter schools. A: As a steward of every constituent’s public dollar, I cannot support current legislative measures that seek to mandate local school boards divert much-needed — and might I add — already insufficient funds to maintain buildings that do not belong to the public. While I can appreciate the need to address the question of capital and maintenance funding needs for all schools, the problem is this legislative bill would have [local school districts] share these already limited funds with charter schools for their maintenance needs. In M-DCPS alone, maintenance needs for our traditional public schools are in the millions. With the general obligation bond program, we have certainly seen many schools’ needs addressed, however, with a large number of our buildings aging and over 50 years old, the need is very much still relevant. Now the Legislature is proposing that school districts actually raise taxes to cover the additional needs brought on by this proposal and also share that revenue among traditional public and charter schools. But why would we raise taxes to fund capital improvements for buildings and properties that are privately owned? The vast majority of charter schools are housed in buildings that do not belong to the public. We are investing public funds in essentially privately owned real estate, and if those charter schools decide they want to change location, their lease is terminated, the building is sold or if their charter is revoked – the taxpayer will have invested in a building that we cannot be assured will serve a public interest. There has to be an answer to this problem that is fair and equitable for traditional public and charter schools. I think we can do better than this proposal. All students, whether they sit in a historic and traditional public school or a charter school deserve safe, inviting and welcoming learning environments. I think we can all work together to find a solution with the mutual goal of providing for all students. Teacher turnover also is a problem. We hire 500 to 1,000 new teachers every year. We should be paying them what they are worth, not what we can afford. Teaching is one of the most important jobs in society, and they’re asked to do more and more. So many students come from foster homes or immigrant families where English is a second language. Many times they haven’t eaten. We love and honor them and feed them. It’s a lot that teachers are expected to do, jobs teachers aren’t supposed to do but society should be doing, and we pick it up because no one else is doing it. Q: Your district now has 126 charter schools with 60,000 students. Although they are technically public schools, they are privately managed. Do you think the charter school movement is a plus or minus for large districts like Miami-Dade? A: Charter schools ushered in an era where public educational options are no longer a monopoly. Miami-Dade has successfully managed to grow and expand its own choice options — to the benefit of communities, parents, and students. Generally, the idea of choice has raised the bar in terms of programming that appeals to broader audiences and student interest. Many charters play function successfully, allowing for school site autonomy and shared decision making that can lead to innovative and responsive educational programming and policies. I’m not afraid of charters. I welcome them and acknowledge that just like traditional public schools, there are some great ones and some not so good. State policies need to work towards leveling the playing fields for all in terms of public schools, traditional and charter. Q: Concerning the value of standardized testing: Teachers complain about teaching to the test and there seems an endless cycle of teachers and students gearing up for and taking tests. Has the pendulum gone too far? A: There is no relationship between a student’s score on the FSA (Florida Standards Assessments) and success in college. No one in our district is afraid of accountability, but to have a single measure for accountability is not right. Doctors don’t use a single test to determine well-being. Why should we? There has to be other options for measuring success and growth. Q: What advice would you give to new teachers and those who want to serve in an administrative capacity at public schools? A: You must feel you have a calling in your heart, and a fire burning and be able to say to yourself: I’m excited today. I don’t know what is going to happen, but I can’t wait to see how I can use theories I’ve learned and see what I can do. That is teaching and that is a fantastic career. You see children who come to school with their heads down suddenly become engaged and excited about learning. Teaching is exciting and important work, and it’s satisfying work. It engages the highest level on Maslow’s famous “hierarchy of needs” and it validates our existence. It’s not easy being in education. But it is so worth it.